This has been an old-fashioned, cold winter. The hills of Angus are still mainly white and the corries, especially on the North slopes, are filled with snow and ice. If the thaw continues slowly we should see water levels holding up, and this should make it easy for the spring salmon to enter the river and move well up into the catchment. It has been an outstanding year for kelt survival. Derek Strachan who you can see in the photograph unhooking a well mended kelt from Indies Pool, caught 13 kelt in one busy morning in late February. But, as I write this in the second week of March, there are still no reports of fresh salmon being caught upstream of Brechin. Now is the time when ghillies and fishery managers are preparing for the coming season’s visiting anglers, who come to the South Esk from all over the World. Huts are being painted, riverside seats and rod rests repaired and oiled and the first shoots of giant hogweed dug up or treated with weed killer. Pools are inspected to see what winter floods damage has occurred, foliage trimmed back, flood debris and litter removed from the banks and the river. I often think of the early weeks of the new season as a kind of phoney war while we await the arrival of the oyster catchers, coming inland to select their breeding sites, and in their wake the spring salmon. At first it is the occasional swirl or blue-black back and iridescent silver flank that you might be lucky to catch sight of, but usually these secretive early running salmon make their presence felt (literally!) by a long-drawn solid tug at the deeply fished fly. That moment has yet to arrive in 2009, but with the river in superb condition, the water clear, deep and lots of it, we expect the first spring fish of the new season to announce its arrival any day now. Fishing for salmon is largely the excitement of anticipation. 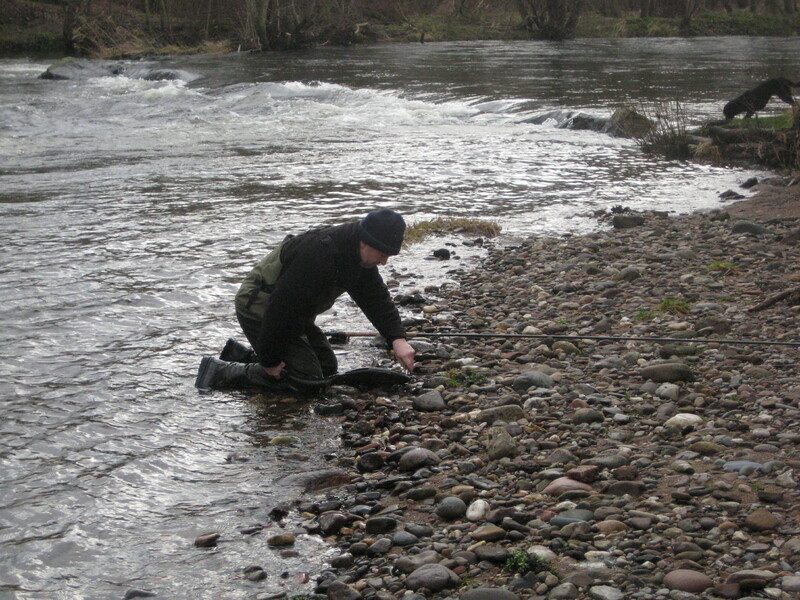 There is nothing to compare with the expectation of the first new-season salmon, and this bulletin will report the event as soon as the first salmon of 2009 is caught and released alive into the river to continue upstream to lay its precious cargo of eggs in a tributary far up in the glens of Angus.